Rachel Browne has been in the hospitality industry for close to 25 years and has held senior management positions for the last 15 years in both Hospitality and Tourism sectors. She has been the manager at Hermitage Bay for the last 10 years and previously held positions with Elite Island Resort as Island Manager of Palm Island. No plans for further development, apart from updates to the kitchen . 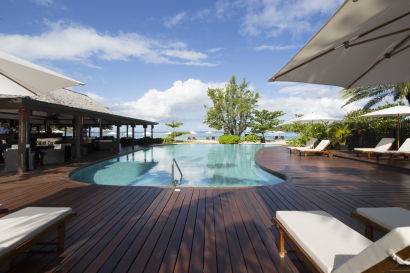 The owner’s appreciation for the raw space and appreciation for the natural island beauty can be found in all of the property details. 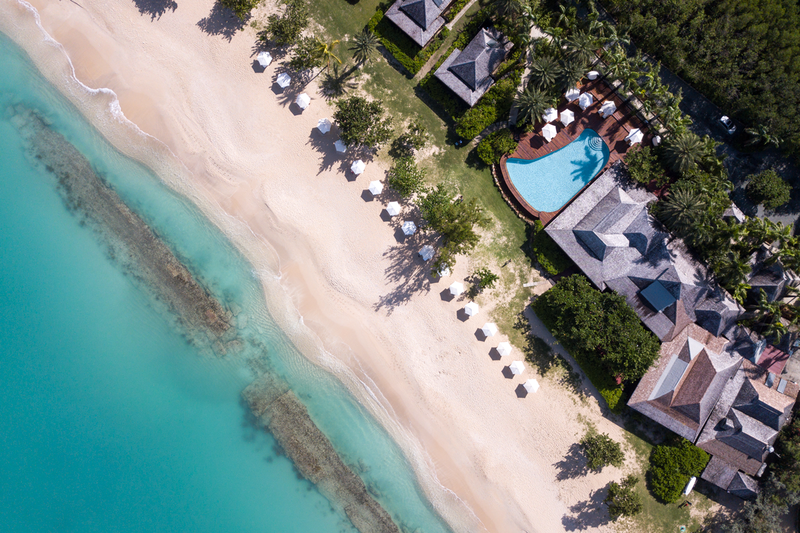 All guest accommodations and public spaces are built into the hillside and beachfront where the “land dictated placement” rather than a blueprint, with each lodging and public space carved out by a hand machete, creating natural edifices rather than a resort full of foreign objects. All materials used have an eye towards preservation and environmental awareness, utilizing indigenous materials (such as dark wood), and installing energy conserving utilities and systems throughout. 2016 : every year Hermitage Bay closes for 6 weeks in the fall to refresh the suites and do any necessary repairs. 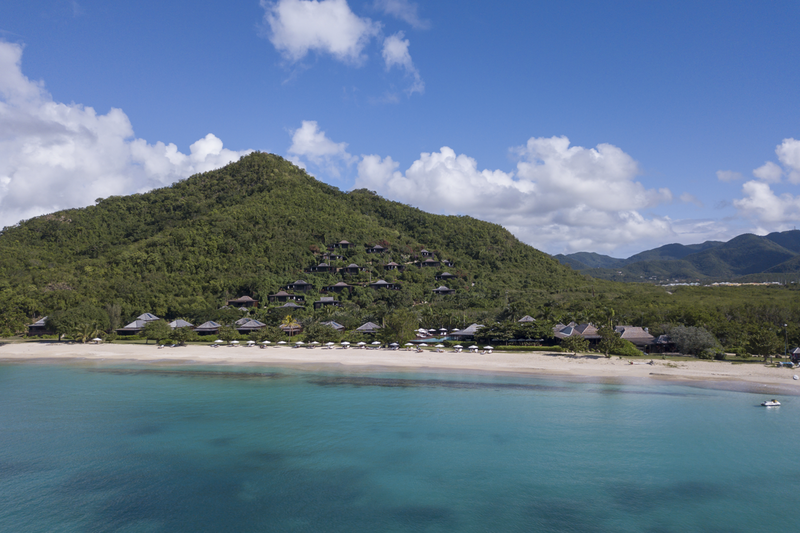 In 2016, we added 3 new Beachfront Suites and 1 Garden Suite. 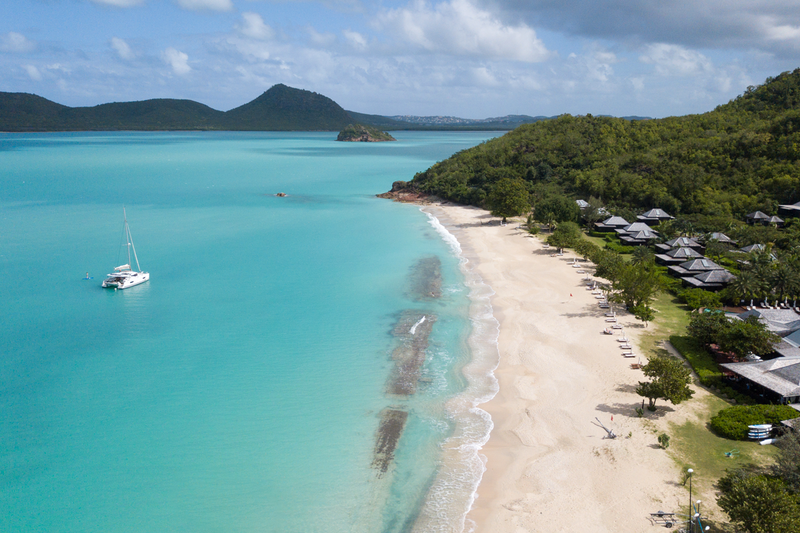 Main strengths are the small size in a secluded bay, and the very relaxed ambiance. 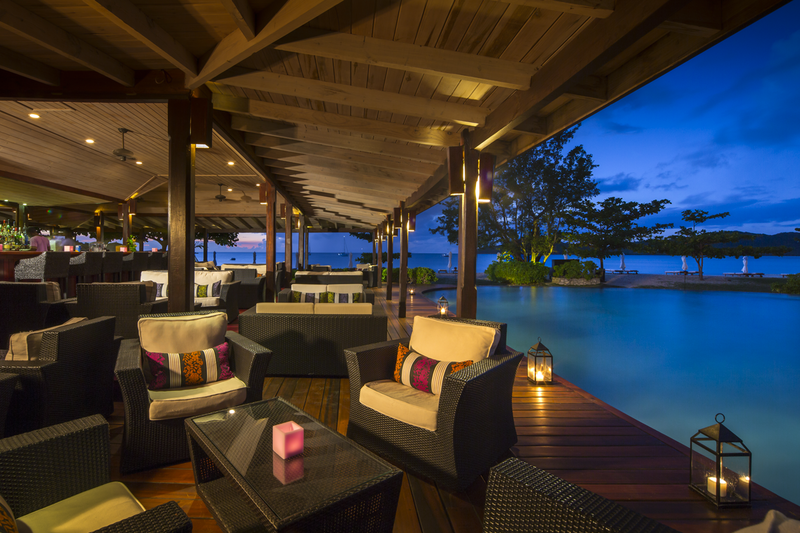 Though a 5 star property, the ambiance is very laid back and not at all pretentious or stuffy. More modern service style, less formal. The use of all equipment, along with instruction if needed, is provided complimentary to guests daily. Available water sports include: double and single kayaks, windsurfing, snorkeling, sunfish, paddleboards, and hobie cat sailing. In order to preserve the peace and tranquility at Hermitage Bay motorized sports are not offered or encouraged. Guest lodging is comprised of luxurious suites. 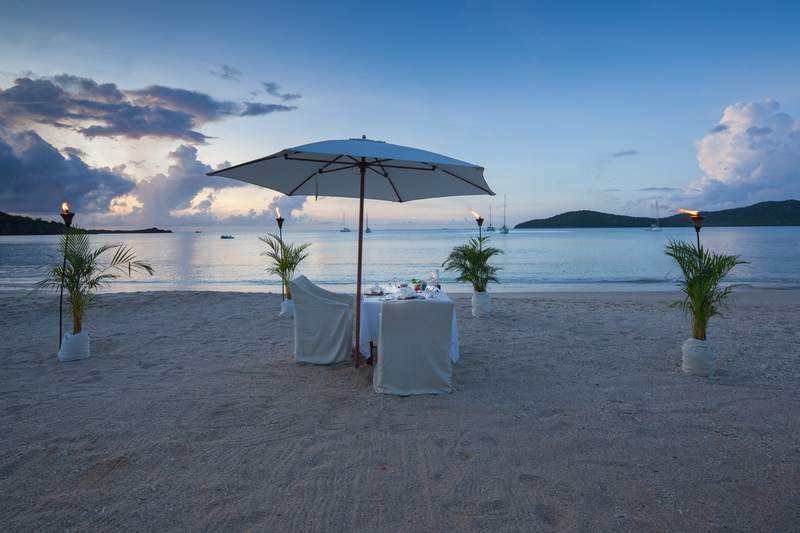 Category offerings include: 17 Hillside Suites, 9 Beachfront Suites and 4 Garden Suites. 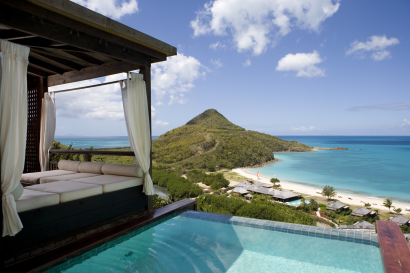 The Hillside Pool Suites have private plunge pools with a sunbathing area and chaises. A wrap-around open-air deck incorporates a lounge area, daybed and dining area. 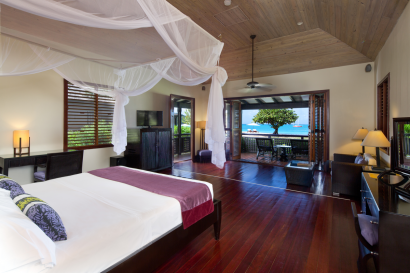 Dramatic dark hardwood floors lead into the air-conditioned bedroom where a king-size bed is draped romantically with sheer white netting. 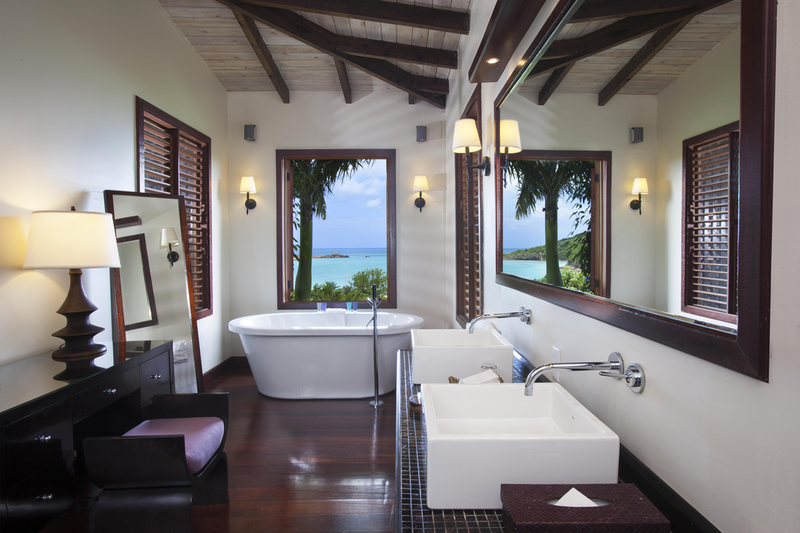 The bedroom leads into a spacious bathroom, where guests can bathe with views of the Caribbean Sea. There are twin wash hand basins, a vanity dressing table, and a separate outdoor “garden shower” which enables guests to shower with a view of the bay. The spacious design provides over 1,545 sq ft of space. 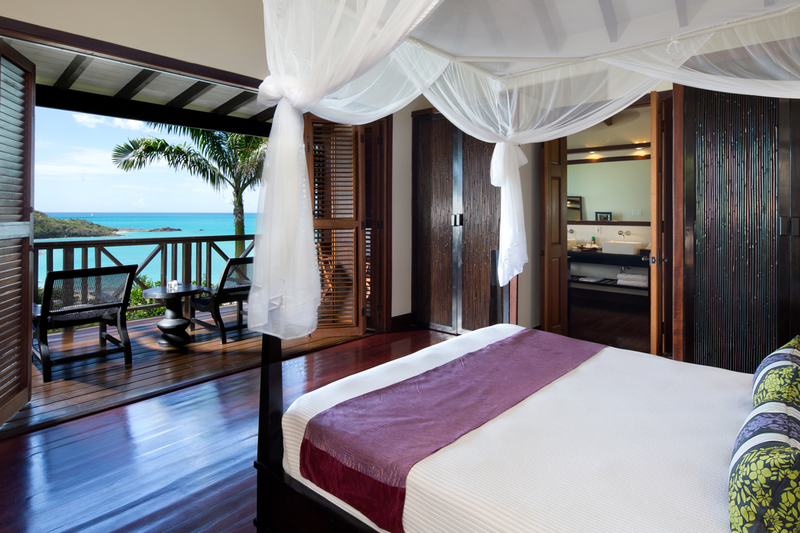 Guests have panoramic views of the Caribbean Sea from all Hillside Suites. The décor is contemporary and sleek, yet the open-air design/layout, and the natural hued fabrics and tiling all give a nod to the Caribbean location and raw island beauty. All Suites (Hillside, Beachfront and Garden) have wide flat screen TV, DVD player, iPod docking station, complimentary wireless Internet, personal safe, mini bar and tea & coffee making facilities. The Beachfront Suites are perfectly positioned alongside the beach, with the Garden Suites sitting just steps back. 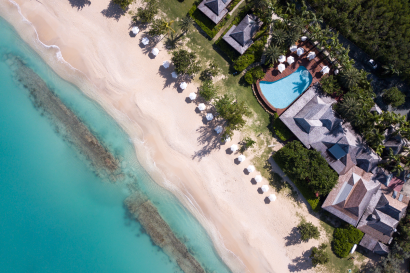 Along with prime beach access, these Suites boast an extensive terraced verandah complete with double daybed, perfect for reading, dozing or stargazing. Both the bedroom and sitting area are air-conditioned. The entire suite offers over 1142 sq ft of space, with the design, décor and amenities the same as found in the Hillside Suites. Chef Desroy and his team place an emphasis on local, organic ingredients updating popular items and creating new favourites, all with a distinctive island essence. Guests are introduced to indigenous fruits, innovative cooking techniques for local seafood, delicious vegetarian options and premium cuts of meat. The restaurant and bar are located in front of the beach. 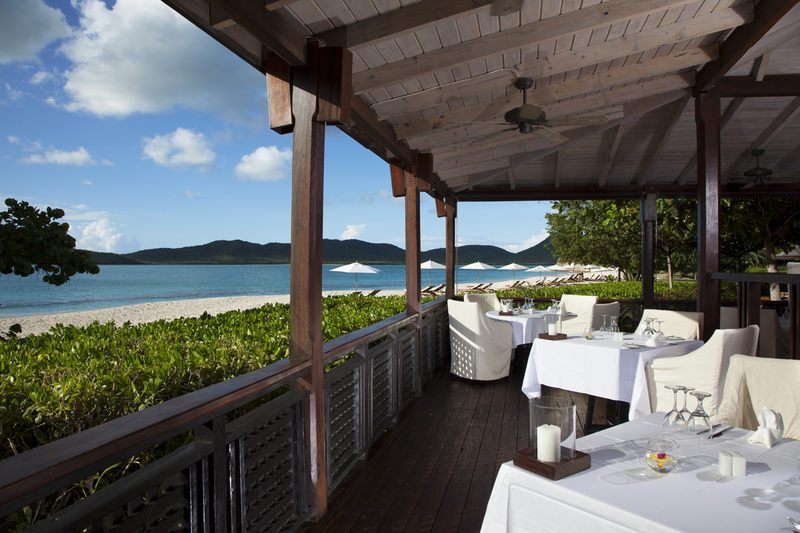 The restaurant is open-air and tiered to afford each table a spectacular view. Lunch is also offered around the shaded patio and pool areas. Service of meals, snacks, and drinks can be enjoyed en-suite at a minimum additional charge. All-inclusive rates include breakfast, lunch, afternoon tea, hors d’œuvres, and dinner, together with a choice of several house wines and all beverages, including premium spirits. A full wine list and deluxe brands are available at an additional charge. 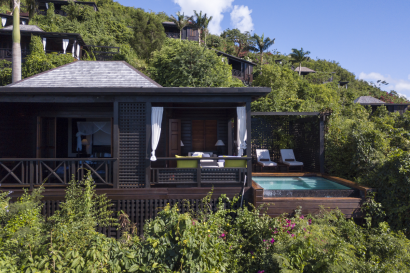 Located in a secluded area on the hillside, the freestanding spa is a tranquil oasis. The spa utilizes the finest quality products, and incorporates local aromatherapy and ingredients into the services. The skilled therapists offer a wide range of body massages, holistic therapies and facial and body treatments. Early morning complimentary yoga and Pilates are offered on alternating days, together with dawn meditation.